Morjim beach in Goa is bound by the mouth of the Chapora river to the south, and the seamless beginnings of Ashvem (and later, Mandrem) beach to the north. The calm, shallow sea washes onto firm sand often scattered with driftwood and detritus from the river. Large numbers of gulls flock around the river mouth, and in November, Olive Ridley marine turtles lay their eggs on the beach. Morjim remains a fairly quiet beach, with huts and shacks scattered along the sand at the south end, and set back amongst the palms and casuarina trees to the north. The protected marine turtles mean that late night lights and music are largely banned, and relaxation, low-key drinking, alternative therapies and occasional kite surfing seem to be the order of the day. In recent years, Morjim has been dubbed, 'Little Russia,' due to the high number of Russian expatriates living there. Some locals and politicians have voiced opposition to this settlement, concerned over links with the Russian mafia. 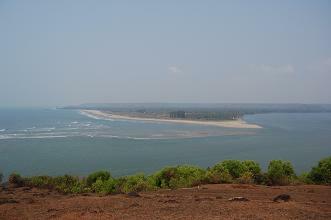 Morjim is off the main coastal road that crosses the Chapora river bridge at Siolim and continues up the coast towards Arambol. Once over the bridge heading north, take a left at the T-Junction just beyond the market by the large banyan tree. Regular buses leave from Siolim to Morjim coming from Mapusa. There are also about 6 buses a day to Panjim leaving from 7 a.m., and one returning from Panjim to Morjim at 5 p.m. The bus will drop you off on the main road, about 1 km back from the south side of the beach. There are a fair number of shacks available just behind the beach, in a mid-price range (R.1000 - R.2000). Many of these have attatched restaurants, good clean facilities and some offer Ayurvedic treatments or yoga classes. Seasonal property rental is commom to Morjim, with self catering apartments (often Russian owned) rented for comparitively high prices. Watch out for disproportionately high prices in the area. Bear in mind that in many parts of Goa, R.1000 will get you good accommodation for the night. Naga Cottages for example have rooms beginning at R.500 a night. The nearest ATM to Morjim is in Siolim just across the river. Internet facilities are contained within the larger hotels and accommodations on Morjim beach. Scooter hire is the usual way to get around if you are staying in Morjim, and rickshaws are thin on the ground, especially at night. Ask around and expect to pay R.200 a day for a scooter. It is possible to walk to Arambol beach from Morjim simply by following the coast, though a little wading across a tidal stream is often required! Any great places for food on Morjim beach? We'd love to hear all about it in our favourite Goa beaches page, including your favourite dish!